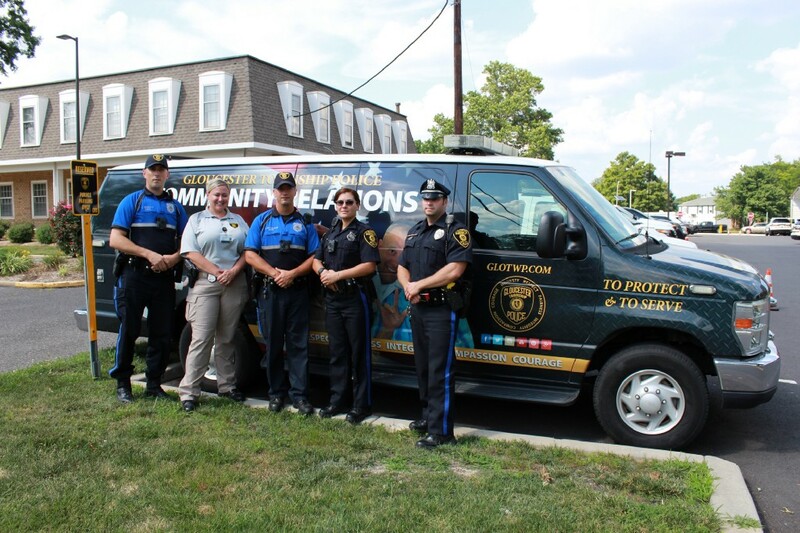 From left to right: Officers Charles Ohrenich, Jennifer McLaughlin, Michael Nicholson, Erica Marconi, and Dennis Richards stand in from on the community relations van. National Night Out is Aug. 1 and will take place from 6 p.m. to 9 p.m. There are 30 neighborhood watches in Gloucester Township. Jennifer McLaughlin, one of GTPD’s community relations officer, said the neighborhood watches traditionally host their area’s National Night Out party. For areas that do not have a neighborhood watch, there will be a public location for residents at the Erial Fire Hall. To sign up your neighborhood watch to host a party, call the police department at (856) 228–4500. McLaughlin said one lady has been hosting parties for 24 years. The GTPD wants to work with residents as a team to reduce crime in the township. “We are here for [Gloucester Township residents] … when they have something they say, we are listening … this is our community too,” police department community relations officer Erica Marconi. There is a lot of collaboration between the residents and the GTPD. “We are humans too, and our community knows that, and that’s why we have a better relationship with the residents,” Marconi said. At the Erial Fire Hall, there will be a DJ, lots of food, a vehicle extrication demonstration and CPR demonstration for families. There are lots of vendors, a caricature artist and face painting, and there will be adoptable dogs from the Camden County Animal Shelter. Every location hosting a National Night Out party will receive a visit from police officers. There are four caravans that will go out. Each caravan will have a mascot from a local community business so children can take pictures with it. The Texas Roadhouse Armadillo will be one of the mascots in attendance. The kickoff for National Night Out is at 5:30 p.m. at the Gloucester Township Municipal Building on Chews Landing Road. The GTPD has been participating in National Night Out for more than 20 years. It has always taken the more traditional approach in having the majority of the parties in the neighborhoods. “We want all our neighbors inside the neighborhoods to get to know each other,” McLaughlin said. National Night Out is a competition. The police department has to submit an agenda, pre-report and post-report. According to the National Night Out website, there are different categories based on the size of the town. Awards are given to those towns or states with the most participation from residents. “We’ve come out first in the state and eighth nationally,” McLaughlin said.